JOIN SUSYN'S "CELESTIAL CIRCLE" TODAY & RECEIVE THESE FREE GIFTS! 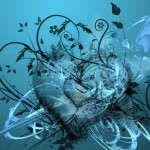 Daily personal horoscopes delivered to your email/cell phone. Daily Inspirational Messages, A Weekly Astrological Forecast, Monthly Numerology and Gemstone Forecasts delivered to your email/cell phone. PLUS these MEMBER EXCLUSIVES you won't find anywhere else! Weekly personal horoscopes delivered to your cell phone/email. All for only $5.95 per month OR Sign up for a year ($60) and it's like getting 2 months free! With your FREE GIFTS and a 1-year subscription (over $60 in savings!) your first year membership PAYS FOR ITSELF! THIS IS AN OFFER YOU CAN'T AFFORD TO MISS! 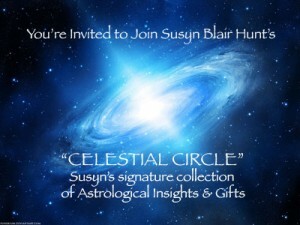 JOIN SUSYN'S "CELESTIAL CIRCLE" TODAY! Please Note: Once you complete your Paypal payment, you'll be taken to a Registration page. Please fill it out and select the horoscope(s) you would like to receive. • UNLIMITED SIGNS - Curious to know what the day holds for your spouse or children? Select as many signs as you like with one subscription - all delivered directly to your email or smart phone. 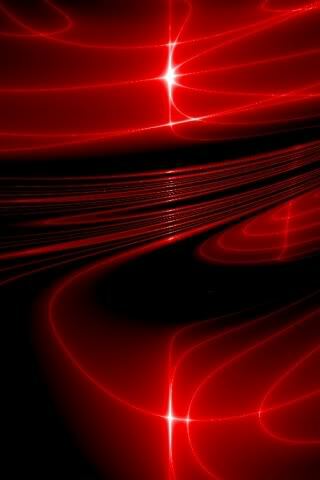 • WEEKLY HOROSCOPES - Want to get a jump start on your week? Members can receive all their horoscopes for the week ahead in a single email - just select Weekly Horoscopes for your sign when you register. • WEEKLY TAROTCASTS - See what the Tarot cards have to reveal about this week. • MONTHLY NUMEROLOGICAL FORECAST - Discover the numerological influences you'll encounter this month. • MONTHLY CRYSTAL WISDOM FORECAST - Discover which stones and gemstones carry the most power this month in the Crystal Wisdom Forecast. • READING SPECIALS - Members get $5 off every readings with Susyn, no limit, PLUS a recording of the session (A $5 VALUE). When you purchase a reading, it's like getting two months membership FREE! • YOUR BIRTHDAY FORECAST FOR THE YEAR AHEAD - Discover your lucky numbers, power color, most fortunate months and spirit guide for the year, based on your birthday. Circle members have exclusive access to Susyn's yearly predictions, so you can see what's in store for yourself or loved ones who are celebrating a birthday. • ASTROLOGICAL TRENDS MONTHLY NEWSLETTER - Filled with interesting articles, recipes and insight, our newsletter updates you on the astrological trends for the month and the ideal way to handle them. For around 16 cents a day ($5.95 per month), (less than the cost of the filters they use to brew your $5 cup of cappuccino!) you can wake up every morning to Susyn’s daily horoscopes and stellar guidance! Join now and never miss a single day of Susyn Blair-Hunt’s amazing horoscopes and forecasts. PLEASE NOTE: Once you complete your Paypal purchase for your Horoscopes Subscriptions, you'll be taken to a registration page. Please fill this out and indicate which horoscopes you would like to have sent to you. Give the Gift of Enlightenment! Here's a gift they'll appreciate 365 days a year! Everyone will love a gift subscription to Susyn's daily horoscopes. For Kajama Gift Certificates, Click Here.